With the Holiday Season coming right up, many of us are already making lists of what to get those friends, family and co-workers for Christmas. Consider the Sewing Notion Value Packs for those who sew, quilt, do crafting, or those who are wanting to learn how to sew. 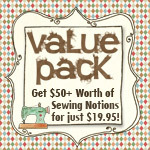 Do you have a $25 limit on gift price — the Sewing Notion Value Pack is just right! Actually, you will be getting FIFTY DOLLARS worth of brand new, off the shelf sewing notions and supplies! Wouldn’t that be a nice surprise for that sewer, quilter, crafter friend or relative? Check your list and order early as this super deal won’t last long! Check them out at SewWithSarah.com. Get more than $50 worth of name brand sewing notions for only $19.95 $15.95! An assortment of top quality new, off the shelf, sewing notions that will be valued at over $50. 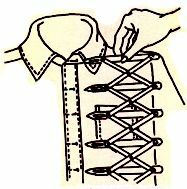 Examples of items that may be included are interfacing, machine and hand sewing needles, thread snips, pins, pin cushions, pattern paper, magnetic seam guides, elastic, bobbins, seam rippers, thread pullers, thread and much more! Great for adding to your sewing notions stash, or super for someone learning how to sew. Excellent for gift giving! No two value packs are exactly the same. Limited quantity. There are only 4 value packs left, so “the early bird gets the worm” is certainly true for this giant sale of sewing notions and sewing supplies. 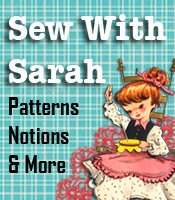 While you’re at the Sew With Sarah.com website, check out the other books, classes and informational articles available.